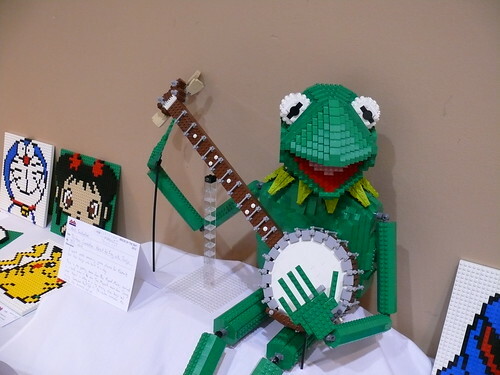 My latest creation is a life size model of Kermit The Frog with his banjo, as seen in the opening scene of the 1979 film The Muppet Movie, when he was playing “Rainbow Connection.” I haven’t done a photo shoot of the model on its own, so for now you will have to be satisfied with pictures from Bricks by the Bay 2012. I will update this post when I have more pictures to add. I was very pleased to have this model voted “Supreme Sculptor” (best sculpture) and “Greenest” (best use of the “Green” theme for the convention). I built the head first and showed it at the February BayLUG meeting. 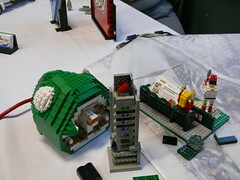 There was a building contest with a theme of “Movies” based on the fact that the Academy Awards were held near the time of the meeting, and I won the adult competition with the head alone. But for Bricks by the Bay I wanted to at least do a bust if not the whole body. My dream was to have a log made of LEGO bricks for him to sit on, based on the scene in the movie, and I may yet do that…. Kermit’s head started with his eyes. When the new movie The Muppets was in the “coming soon” phase, and I kept seeing ads for it, I started thinking about how a partial Lowell sphere would be a good way to model his eyes, and thought about how a 2×2 round tile can be mounted centered on a 1×4 plate (If you haven’t seen this before, try it! 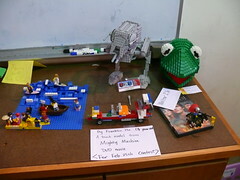 The 2×2 round tile is one of the most versatile pieces LEGO makes.) To make the shape of his head come out right, I had to mount the eyes at an angle, which is done by some interior clips, and then build up LEGO slopes to try to make it fit in as seamlessly as possible. There are even some 1×1 “Henrik” (cheese) slopes that are sandwiched in between parts but not actually attached to anything, just to fill in the gaps! A week before the convention, all I had was his head and collar. The rest of the body, arms, and legs, were built during those few days before the convention. The body is pretty straightforward construction, but the arms and legs were trickier. I used the Technic click hinge joints to articulate them, and though they aren’t strong enough to hold up the arms and legs in a pose, they do allow the range of movement needed (well almost – his hands don’t quite reach where the strings on the banjo should be). The arms and legs are octagonal in cross-section, but because inverse slopes in green are much less common, I built them by constructing each segment studs-out and then mounting them together back-to-back using various methods. The hands and feet are simple assemblages of green plates. I wish I could have made the fingers articulate but I didn’t have the parts in green to do that. But by far my favorite part of this model is the banjo, and that was done in a day from parts I had on hand. I made the circle out of 1×2 log bricks interspersed with 1×1 round bricks, with a wall of white 1x bricks to form the face of the banjo. The neck and other details came together out of basic bricks and plates in a straightforward manner. The round part of a banjo is basically a drum, and so there are tightening screws all the way around it to adjust the tension. I simulated those using grey LEGO bars mounted on clip plates, and think it comes off looking quite realistic. I did not string the banjo, because I was afraid I wouldn’t be able to get the strings taut enough to look right. I might see if I can add strings to improve it later though. I used the head of Kermit as a demonstration model in the SNOT (Studs Not On Top) panel at Bricks by the Bay, and plan to post some more detailed pictures of the construction techniques used in the future, so watch this space. If you missed Bricks by the Bay, I plan to bring Kermit to the Bricks Cascade convention in Portland in June, so look for him there. All the photos of Kermit are in the Rainbow Connection photoset on Flickr (click any of the photos in this post, or view as slideshow).